Has anything really changed? Is it still just as difficult to walk in faith today? Has our generation really grown up that much more than those two standing in that dirt road listening to a stranger explain it all? That discouraged couple represents us all. Maybe that’s why Jesus came back and made sure he caught them before they got home. He’s acting like the father of that prodigal son or the shepherd searching for that one lost lamb. He’s caught them as they move in the wrong direction and he challenges their lack of faith. They seem to know the truth, but because they’re in retreat, they don’t believe the truth. 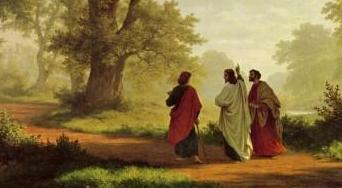 Jesus takes them to an “A-Ha!” moment of belief. It sounds like they knew their Scriptures. He helped them to connect the dots. He showed them where the story was leading. Later in this account they tell each other that their hearts were on fire as he taught them. Their faith was ignited as all the pieces of knowledge and their own experiences came together. Right now the Holy Spirit resides in all believers to do this same thing. “But when the Father sends the Advocate as my representative—that is, the Holy Spirit—he will teach you everything and will remind you of everything I have told you” (John 14:26). Why couldn’t these two remember all those lessons they had learned while growing up? Sometimes I wonder if what I’m learning is getting filed away as just “interesting information” and not real truth that I should be living out loud. Are your beliefs all tucked away, safe for a rainy day, folded up neatly in that Bible, never once to see the light of day (or heat of battle)? What did these two eyewitnesses do with the Jesus they had just seen and heard – maybe even watched die on the cross? It’s usually safer to just walk away and not say or do anything. I mind my own business too often or worse I mind other people’s business way too much. It’s safer to play by the rules. It’s risky to love, to turn the other cheek, to give up, to sacrifice, to become invisible and die. Are you living a life that’s in retreat? Nice blog Randy! Have a good summer.